AvoDerm Natural Chicken Meal & Brown Rice Formula Adult Dog Food uses Vitamin Rich California grown Avocados for Healthy Skin & Coat ! 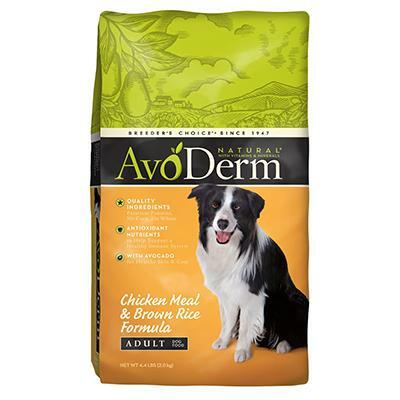 Avoderm is antioxidant rich for a healthy immune system and is highly digestible. Select Ingredients:Chicken Meal, Ground Whole Brown Rice, Ground Whole White Rice, Oatmeal, Chicken Fat (Preserved with Mixed Tocopherols), Rice Bran, Avocado, Natural Flavor, Tomato Pomace (Source of Lycopene), Flax Seed (Source of Omega-3 Fatty Acid), Alfalfa Meal, Herring Meal, Salt, Potassium Chloride, Kelp Meal, Vitamins (Choline Chloride, a-Tocopherol Acetate (Source of Vitamin E), Niacin, Calcium Pantothenate, Vitamin A Supplement, Ascorbic Acid (Source of Vitamin C), Pyridoxine Hydrochloride (Source of Vitamin B6), Thiamine Mononitrate (Source of Vitamin B1), Riboflavin Supplement, Vitamin B12 Supplement, Vitamin D3 Supplement, Biotin, Folic Acid), Minerals (Zinc Sulfate, Zinc Amino Acid Chelate, Ferrous Sulfate, Manganese Sulfate, Manganese Amino Acid Chelate, Copper Sulfate, Copper Amino Acid Chelate, Sodium Selenite, Calcium Iodate), Avocado Oil, Lecithin, Rosemary Extract, Sage Extract, Pineapple Stem (Source of Bromelain), Papain, Dried Bacillus Subtilis Fermentation Product, Dried Aspergillus Oryzae Fermentation Product.